Unstuck: What to Write When You Don’t Know What to Write – Write Reality – The official blog of Michelle Tuckett, word ninja. This approach is for the kind of stuck that just keeps us from writing anything at all, even a small practice piece or blog, when words simply won't come and we are left feeling empty and alone, abandoned at the start, and we are lost and frozen in space, searching for he brilliance we are sure lurks somewhere within. Lots of writing teachers and books will counsel us at this point to write anything, anything at all, even it it's just writing “I don't know what to write.” Over and over. I hate it because though it may not work perfectly, affirmations (saying the same thing over and over to change a thought pattern) are used with at least some degree of success. Affirmations have been used to quit smoking, to ease depression, brainwash people, all kinds of things. If there is even a small chance that these work, why would we ever write down that we don't know what to write? Another option is to take a breath and write about reality. Buddhists teach mindfulness meditation, the practice of sitting and simply observing the moment as it passes, seeing reality as it is. It is a way to relax and reset our perspective, to develop compassion, if you will, for living. And this works very well for a writing stuckage as well. Reality is always there, we will never be at a loss for material. Even a blank white wall has paint streaks and imperfections to record. To write this way, we simply write what we see, what we observe. Write only what is seen and know, what is right there, present in space with us. Stick to the facts, to start, and let the limitations force us to find what is interesting. I am curled up on the living room sofa, leaning against a big tan cushion with black artistic doodles sketched across it. My cat snores from behind the sofa. 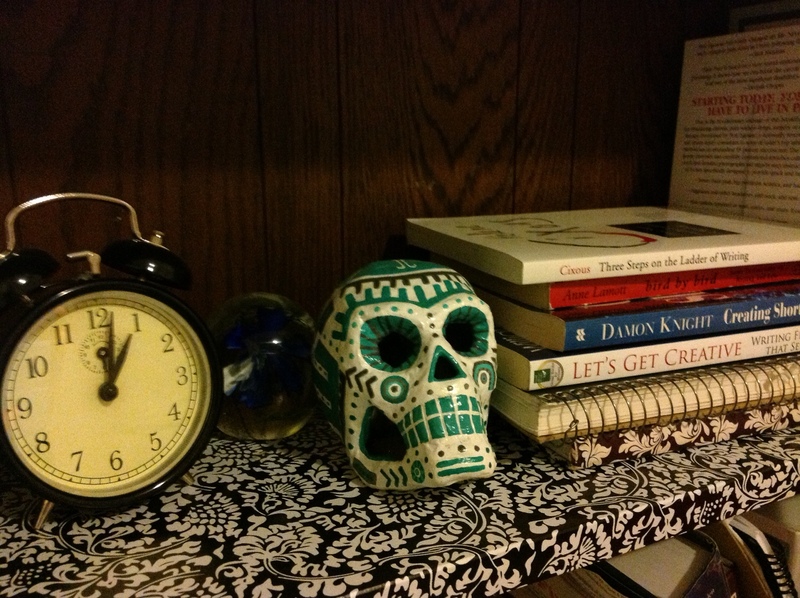 A paper mâché skull stares at me from the clutter of the bookshelf nearby. It was a gift from a tarot client, made for me with care and lines of turquoise and gray paint in South America patterns. It sits next to an ikea clock, hands unmoving. Between them, the paper weight left to me by my grandmother, company to the macabre. Writing like this connects us to the moment, and we can find the space there, in that connection, to grow. Soon, the observation of a stain on the wall will led to the memory of when we filled our water gun with grape juice as a kid and chased out siblings around with it. Or maybe hidden between the objects and experiences, we record is a story we need to tell. Or the solution to a plot we can't budge. This also works when a character stops talking to us. Take a breath and have them describe what they see, let them speak to us with their environment and how they see it. The key is space, and time, and the chance for our poor minds to realize that it is time to write. It teaches us that writing can happen anywhere, any place, and that being stuck is just an illusion, if a persistent one. I really admire your writing style and your voice. This post, and all of your posts, are very inspirational. Thank you so much! The feedback really means a lot.